The commUNITY Dialogue Series (cDS) is aimed to engage students, faculty, staff, and community members in dialogue regarding topics such as identity, research, culture, and current events. Each installment of cDS hosts a speaker from Florida State University, Florida A&M University, Tallahassee Community College, or the greater Tallahassee community. 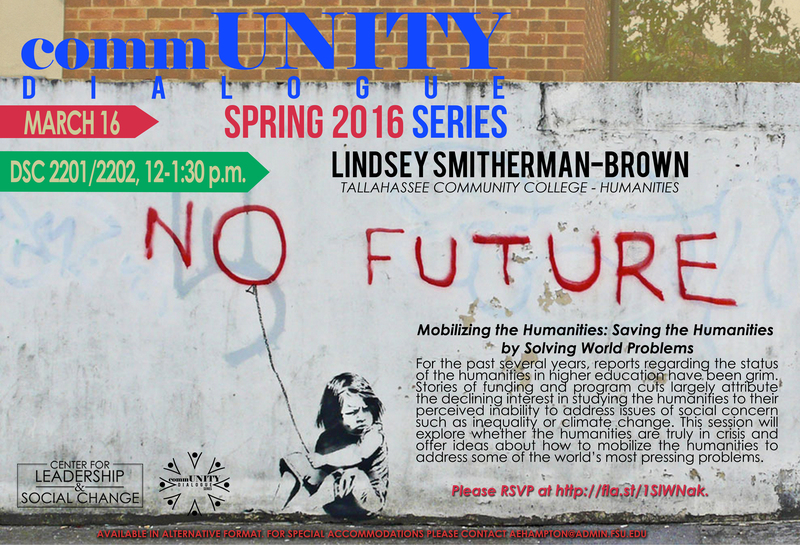 On March 16, 2016, Lindsey Smitherman-Brown (Assistant Professor of Humanities at TCC) will present on the status of humanities in higher education and how to mobilize humanities to address some of the world’s most pressing problems. The event takes place on the Florida State University campus in the Dunlap Success Center, room 2201/2202 from noon to 1:30pm. Any and all are welcome to attend this program! 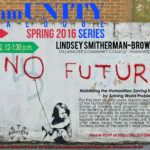 Those interested should RSVP to the event online at this link.